Select from the list of countries we provide service and receive the best exchange rates. Let us know who you would like to send money to and the method. Input your bank, debit or credit card payment info and send. Track your transaction progress. Have the peace of mind every time you send money. Send money within just a few minutes. 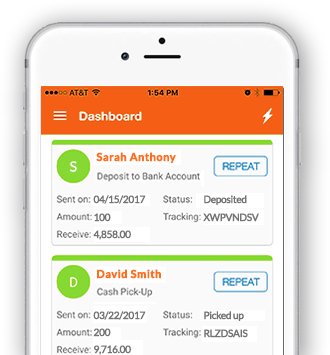 Our app allows our customers to send even faster. Save even more by earning Rewards. Trusted since 1991. We have been delivering great service to our customers for over 25 years. "Lucky Money provides excellent customer service! I have been using their remittance service for a while now and I recommend Lucky Money to everyone.” -Jennifer D.
"Lucky Money has been my choice to send money to India. It’s so easy and the staff knows me well and are so fast.” -Senthil N.
"I’ve been sending money with Lucky Money for years. Now that they offer a mobile app, I can send my money from almost anywhere.” -Pilar M.
Download our FREE app and enjoy sending with Lucky Money today. Available for apple and android. Receive money from the banks you trust. We work with major banks all over the world. Sending money worldwide with LuckyMoney.com is fast and easy. Pay with your U.S. bank account or pay using major credit cards. Lucky Money partners with banks and money transfer payout providers (click here to view services) in each country, so your recipients can pick up the money in cash, receive money in their bank account, or if available, have the money delivered to their door. First time customers can create an account in less than 30 seconds. Click here to create your account and send money. * First transaction is free when you pay with your U.S. bank account. Money in Minutes available to repeat customers with verified bank accounts and successful transactions. Additional $1 fee is applied when sending amounts less than $100. New Customers: A one-time bank account verification takes 1-2 days for the first bank account payment. Restrictions apply. Limited time offer. †Some agents charge additional fees. Lucky Money may or may not make additional profits from the currency exchange rate based on individual agreements with its various delivering agents.